Canton, Miss., 1861, 5¢ black, sharp bold strike of provisional handstamp and with matching neat "Canton Miss. 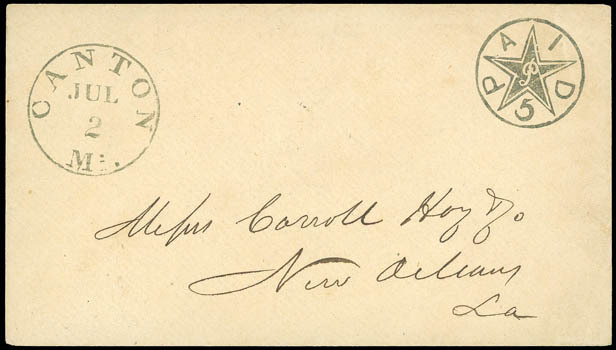 Jul 2" cds on fresh 1861 buff cover from the Carroll Hoy & Co. correspondence to New Orleans La., usual light file holes, Extremely Fine, the second earliest recorded use of this Provisional, ex-Walcott, Everett. A CHOICE EXAMPLE OF THE CANTON MISS. PROVISIONAL ENTIRE. 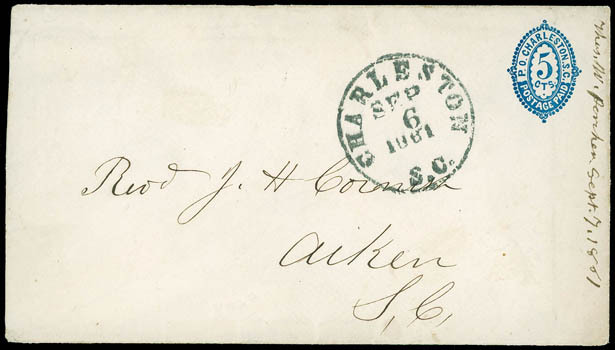 Charleston, S.C., 1861, 5¢ blue, woodcut printed indicia on white envelope to Aiken, S.C., with bold neat strike of "Charleston, S.C., Sep 6, 1861" cds, docketing at right, Very Fine and choice. ONE OF THE FINER EXAMPLES OF THE CHARLESTON, S.C. 5¢ BLUE ON WHITE PROVISIONAL ENTIRE. Mobile, Ala., 1861, 5¢ blue, large margins except just touching at left, tied by "Mobile, Ala., Sep 22, 1861" cds on advertising cover with blue embossed Gary, Maggard & Co. Commission Merchants cameo shield corner card to Spring Hill Ala.; opening tear at top and part of flap missing, otherwise Extremely Fine. 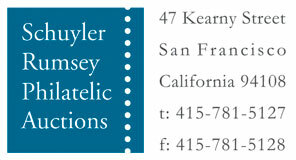 AN ATTRACTIVE USE OF THE MOBILE 5¢ BLUE PROVISIONAL ON A CAMEO CORNER CARD COVER. Nashville, Tenn., 1861, 5¢ carmine, horizontal pair, rich color, margins large to just in at right, tied by blue "Nashville, Ten., Aug 23, 1861" cds on orange buff cover to Mess. Carroll, Hoy & Co. in New Orleans, La. ; couple small filing pinholes at center as usual, Very Fine, ex-Hart. 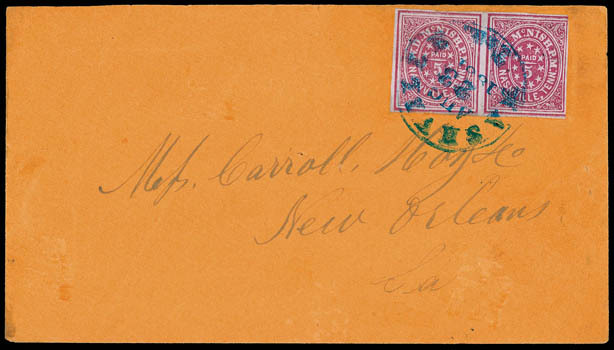 AN EXTREMELY RARE ON COVER MULTIPLE USAGE OF THE 5¢ CARMINE NASHVILLE PROVISIONAL ISSUE. The Crown survey records only six on cover pairs for both of the red color issues. 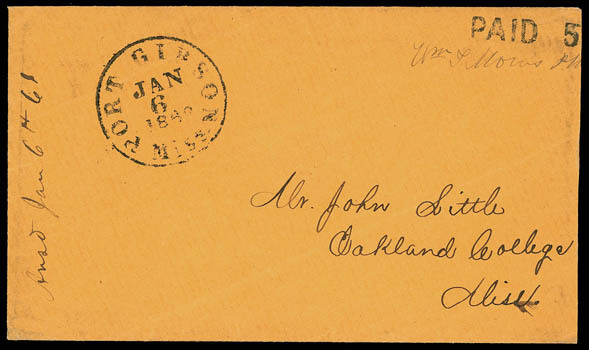 Port Gibson, Miss., 1861, 5¢ black, handstamp postmaster provisional entire with manuscript "Wm. T. Morris P.M." postmaster control signature below, to Oakland College, Miss with "Port Gibson, Miss., Jan 6, 1862" cds, with original enclosure datelined "Port Gibson, Miss., Jan 4th 1862" with letter beginning…I send herewith the twenty dollars (Confederate Note, couldn't get New Orleans); entire slightly reduced at right, Very Fine, listed but unpriced in the Scott catalog; with 2003 C.S.A. certificate. C.S.A. Catalog No. POR-MS-E01. Scott No. 142XU1 Estimate $5,000 - 7,500. THE EARLIEST OF TWO KNOWN EXAMPLES OF THE PORT GIBSON, MISSISSIPPI POSTMASTER PROVISIONAL. 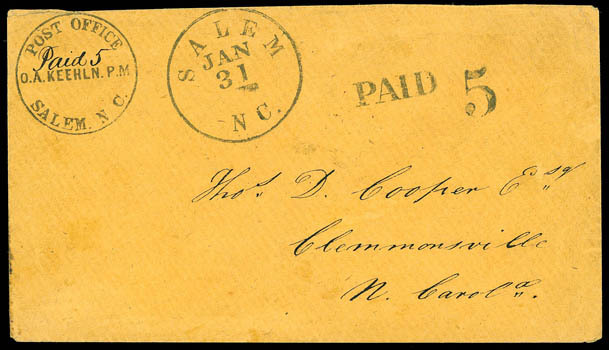 Salem, N.C., 1861, 5¢ black, choice strike of circular handstamp with manuscript "Paid 5" at center, on fresh cover to Clemmonsville, N.C., with "Salem, N.C., Jan 31" cds and additional straight line "Paid" and "5" rate handstamps, Extremely Fine and choice, ex-Myerson; with 1987 P.F. certificate. Scott No. 73XU1 var. $1,750 for normal. 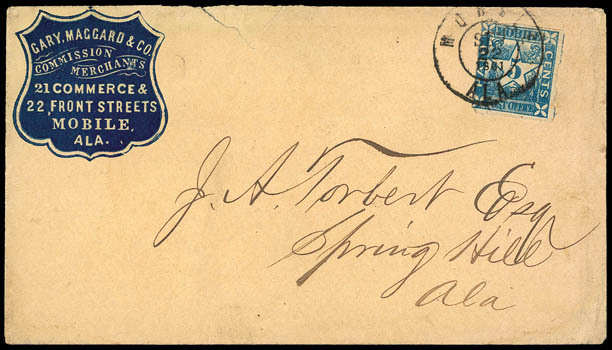 AN EXCEPTIONAL EXAMPLE OF THE SALEM N.C. 5¢ POSTMASTER'S PROVISIONAL - THE FINER OF TWO KNOWN USAGES BEARING BOTH THE MANUSCRIPT AND HANDSTAMP "PAID 5" MARKINGS. 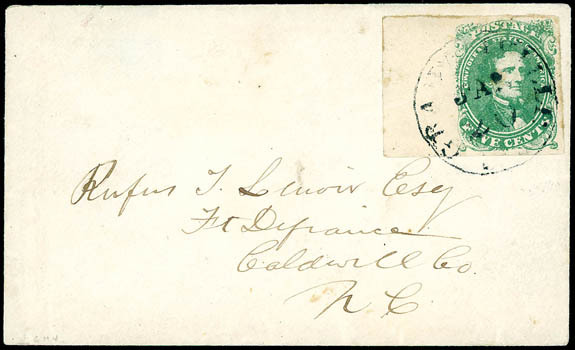 1861, 5¢ green, left margin single, wide sheet margin with large margins around, tied by "Granville, S.C., Jan 20" cds on 1862 cover to Ft. Defiance, N.C., with pencil postscript on inside of flap…20th All quiet. Probably a mistake about the arrival of the Burnside Expedition., Extremely Fine, certainly one of the earliest Confederate references to the Burnside Expedition; with 2015 P.F. certificate. Scott No. 1 Estimate $1,500 - 2,000. A GEM 1861 5¢ GREEN USAGE ON COVER WITH EARLY REFERENCE TO THE PENDING BURNSIDE EXPEDITION. Although the Burnside Expedition initially started on the 5th of January, due to problems including severe weather, it wasn't until February 7, 1862 that a hundred Union vessels steamed down Croatan Sound to land an amphibious force on Roanoke Island starting the first engagement of the expedition. 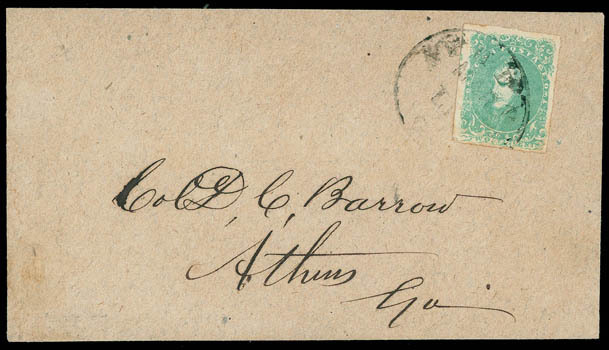 1862, 2¢ green, large margins, strong bold color, tied by light "Athens, Ga., May 11" cds on immaculate homemade drop cover addressed to Col. D.C. Barrow, Very Fine and attractive; with 2013 P.F. certificate. A CHOICE SINGLE DROP COVER USAGE OF THE 1862 2¢ JACKSON ISSUE. 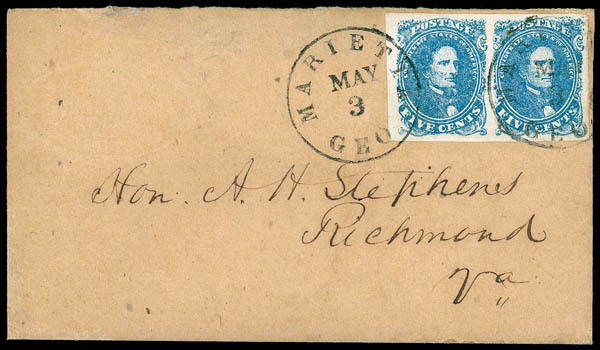 1862, 5¢ blue, horizontal pair, large to huge margins, vibrant color, tied by two neat strikes of "Marietta, Geo., May 3" cds on pristine cover to C.S. Vice President Alexander H. Stephens in Richmond, Va., with embossed oval "A.J. Hansell, Counsellor At Law, Marietta, Ga." corner card at upper left, reverse with 1862 docketing regarding appointment for assistant enroller of conscripts; cover as fresh as the day it was sent, flap missing as always, an Extremely Fine gem; with 2014 P.F. certificate. Scott No. 4 Estimate $1,000 - 1,500. 1863, 10¢ blue, "frame lines", vertical strip of 4, o.g., margins large showing framelines at right and bottom and most lof framelines at top and left, bright pale blue shade, flaws including creasing, small stains and tear in bottom stamp, Fine appearance, ex-Caspary. AN EXTREMELY RARE MINT STRIP OF FOUR OF THE 1863 10¢ "FRAME LINES" ISSUE - POSSIBLY UNIQUE IN VERTICAL FORMAT.